. . .okay, we're stalling. We are STILL missing the reversing contactor and the adapter to connect the motor shaft to our drive shaft, and, since the installation will tear up the whole back end of the boat for a couple of days, I'm kinda not wanting to do anything back underneath the cockpit until we can do ALL the stuff. So we've been doing other things, brewing hard ciders, making meals, and, in general, enjoying what is being a really beautiful fall here on the Middle river. 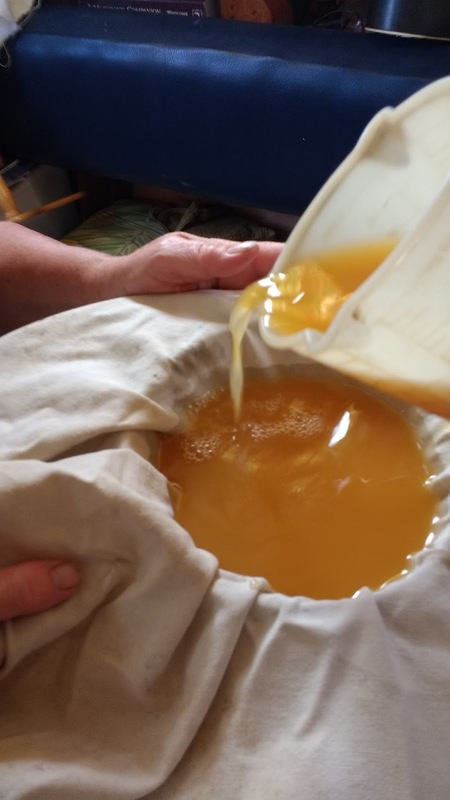 Filtering a wonderful new batch of pumpkin and apple cider. Tis the season. Filled bottles doing a bit of secondary fermentation and carbonation. Can't wait. Of course one thing we had to deal with this morning--and it's unusual--was a massively high tide. This one was weird. My spouse dragged me out of the sack a little after 7AM saying the water was nearly over the dock. By the time I pulled on some jeans and got off the VERY high riding boat, the wet stuff had risen above the boards ( in all of about ten minutes) and I was sloshing down the dock checking people's lines, some of which were, due to the boats riding so high, tight as bowstrings. 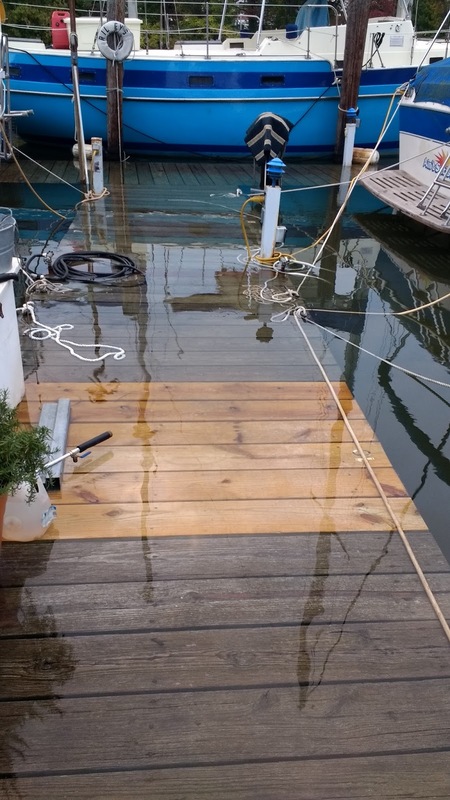 Um, surely the wet stuff is supposed to be on the UNDER side of the dock, right? Half an hour later, it was back below the boards, then an hour later, back above for a few minutes. . . we finally figured out it was being driven by an unseasonable south wind downstream shoving around some heavy rains that were flowing into the bay from PA.
Ah well, living aboard. Just part of the fun. I kid, but it IS fun, even stuff like this. Heard from David, the gentleman who bought our shantyboat "Floating Empire" from us, and found out that he's doing a major rebuild, replacing and adding to the floatation, replacing the side walls, and, in general, doing the stuff that needs to be done to extend the life of our beloved Shanty. Good on you, Sir. 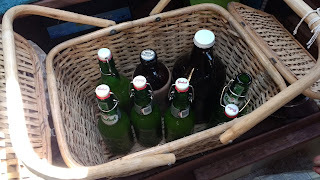 So here we sit, enjoying the leaves changing, taking trips in our little inflatable kayak, brewing beer and cider. . . .Gail is doing artwork madly (here see Life, Art, Water, her blog) and I'm currently working on two, count em, TWO new novels, one of them a sequel to The Ganymeade Protocol (which has been oft requested).